Yesterday, I cancelled my cable TV service and switched to YouTube TV. To my surprise, it took less than 10 minutes on the phone with Comcast to switch to an Internet-only plan, and I wasn’t even asked why I was downgrading my plan or persuaded to reconsider my decision. 60fps: YouTube TV now supports 60 frames per second (fps) frame rate on many sports channels including the ESPN family of networks and Big Ten Network. This was one of the biggest issues I had during my original trial, and I’m happy to see buttery smooth motion on the most popular sports networks. However, there are still many channels missing 60fps support that I hope are added soon. Channel switching: YouTube TV’s new “Recently watched” section makes it super easy to switch to recently watched channels, addressing another major pain point from my trial. This new menu, which can be accessed by pressing/swiping down twice on a remote while watching a channel, largely addresses the navigation issues with the service. TNT, TBS, and truTV: YouTube TV announced support for new channels including TNT, TBS, and truTV on February 14 which were some of the only channels I was missing. Now I won’t have to miss Impractical Jokers and NCAA tournament basketball games! Apple TV app: The YouTube TV app for Apple TV was announced on February 1 and works well. I like having the option to use either my Xbox or Apple TV to watch TV because I frequently switch between the two. Still $35/mo: One of the biggest selling points of YouTube TV for me is the $35/mo, contract-free price tag. However, with the same announcement that introduced the new channels mentioned above, YouTube TV also announced they would be raising the price to $40/mo for new subscribers after March 13. This time pressure was one of the main things that sparked my renewed interested in YouTube TV because I wanted to act quickly to lock in the $35/mo price if my issues with the service had been addressed. NFL on FOX: I’m not 100% sure whether this has been addressed, but YouTube TV’s available networks help page no longer calls out that NFL games on FOX are unavailable. Verizon recently lost exclusive NFL mobile broadcast rights, and I suspect this may benefit YouTube TV subscribers. If it turns out that NFL games are still unavailable when my Super Bowl champion Philadelphia Eagles take the field this fall, I will buy an over-the-air (OTA) TV antenna. Even though all of these updates were compelling enough for me to make the switch, I’d still really like to see some more of the issues I called out in my original post addressed such as improved DVR management (ex: record only new episodes and delete watched episodes), offline DVR access, reduced stream delay, and 60fps support for all channels. One day after making the switch, I feel happy with my decision and surprisingly free. Oh, and I’ll be saving $70/mo. In the last year, I’ve been thinking a lot about cutting the cord, or ditching my cable TV service. I currently have Comcast’s XFINITY TV offering, and their product is actually pretty good. I like that their X1 “entertainment operating system” DVR can record many shows at once, the X1 remote is excellent, and Comcast even has a solid app for watching TV on my phone (with offline download) called XFINITY Stream. So why do I want to cut the cord? Because it’s my most expensive monthly bill at close to $200/mo (including Internet and HBO), and the price seems to increase randomly every few months. I’ve researched Sling TV and DirecTV Now in the past, but they’ve never quite checked all of the boxes. It wasn’t until YouTube TV announced apps for Xbox One and Apple TV in late October that I thought I might actually cut the cord and go with YouTube TV. And now that the app is available for Xbox (alongside an existing app for iOS), I decided to sign up for YouTube TV’s 7 day free trial. I even went “all in” by hiding my cable TV remote so that I could test whether it could truly replace my cable TV service. After downloading the app on my Xbox, I explored the app a bit and started watching a college football game that was on TV. I like to watch sports on TV with the Twitter app open on my phone so that I can check out what other fans and journalists are saying about the game in real-time, especially when I’m watching my alma mater Penn State. While I was watching the Penn State football game during my trial, I noticed that other people were tweeting about plays that I hadn’t even seen yet, something I’d never experienced while watching with cable TV. I was even getting ESPN push notifications about plays that I hadn’t seen yet too. I noticed that other people were tweeting about plays that I hadn’t even seen yet. I estimated that the YouTube TV stream was about 30 seconds behind the live action, which made me feel less connected to the game. I noticed the same issue with other channels and other games, so it wasn’t isolated to one particular game. Channel 623 = ESPN, Channel 105 = NBC, Channel 634 = Tennis Channel, and so on. My brain has memorized all of the channel numbers I watch frequently on cable TV, so navigating to a channel is as simple as typing three numbers with my cable TV remote. Of course, it’s not ideal to have to memorize channel numbers, but after you do, switching channels is super fast. With YouTube TV, random access channel surfing becomes a thing of the past, and I missed it a lot. Switching to a different channel was easy if the channel was directly above or below the channel in the YouTube TV guide, but was a lot more cumbersome if it wasn’t (and the channel I wanted to watch next never seemed to be a few clicks away). With YouTube TV, random access channel surfing becomes a thing of the past, and I missed it a lot. I found myself becoming more intentional about switching channels, rather than just casually channel surfing, because switching to another channel required a lot of button clicks and actually felt like a lot of work. 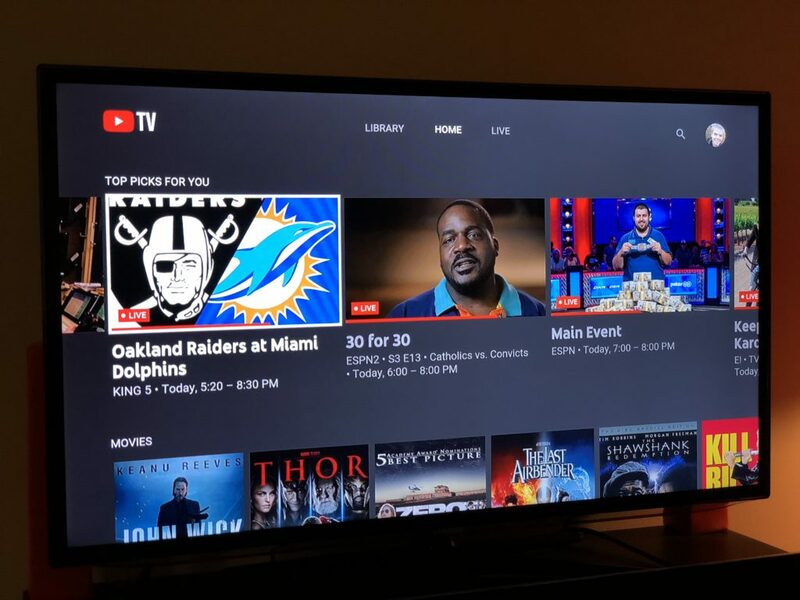 YouTube TV could help solve this problem with some (improved) artificial intelligence or machine learning in their “Top Picks for You” section on the Home page of the app, which didn’t seem to learn the channels I watched frequently. After starting my trial, I immediately set up recordings for my favorite shows. Unlike my cable TV DVR, YouTube TV has a cloud DVR with unlimited storage. This means I didn’t need to worry about managing a priority queue or making space for new episodes. There’s no way to record only new episodes. After adding a TV show to the “Library” to record it, both new and repeat episodes were set up to record, which lead to a lot of noise in my recording history and list of upcoming recordings. There’s no way to “delete” episodes you’ve already watched. After watching a recorded episode, it doesn’t get removed from the Library, so my recording history was even more noisy and cluttered than I’m used to. There’s no way to download recordings to watch offline. This is a feature that I’ve been enjoying with the XFINITY Stream app for my transcontinental flights, and while it’s not a deal breaker, it definitely felt like a downgrade. Overall, with the YouTube TV DVR, I felt less in control of what was being recorded and I spent more time figuring out what new things to watch because of all the clutter and noise. Note for football fans: FOX has not secured the rights to NFL games on its national feed, FOXNet. Users in Albuquerque, Austin, Birmingham, Cincinnati, Cleveland, Denver, Greensboro, Greenville (South Carolina), Harrisburg, Hartford, Indianapolis, Kansas City, Milwaukee, Norfolk, Portland, Raleigh, Sacramento, Salt Lake City, San Diego, Seattle, St. Louis, and West Palm Beach will not see NFL games on FOX. For the first time during my trial, I had to switch back to my cable TV service to watch something, and that’s obviously not something I could’ve done if I had already cut the cord. Overall, I see a lot of potential and cost savings with a live TV streaming service like YouTube TV. The price point is pretty much perfect. And while there are a few missing channels like HGTV, TruTV (for Impractical Jokers), and NFL RedZone, I’m willing to give those up. At the end of the trial, I decided I’m not quite ready to make the switch due to the picture quality reliability, stream delay, navigation challenges, missing DVR features, and missing NFL games. I think all of these can be fixed over time, and once they are, I’ll give it another try. So YouTube TV, it’s not a no, it’s just a not right now.